Answering an ad that says, RV for sale by owner, can be a great way to buy a recreational vehicle. It can be a lot cheaper than purchasing one off of a lot, but there are a few things you need to watch out for when answering that ad. Viewing an RV You are going to be living in this RV whether for a few days or months (like we did while building a house) so you need to see if it was well taken care of. Create a checklist before you go to the owners house, and get a feel for this RV. Personally, we looked at about 10 before we felt comfortable purchasing one. We came across many ads. You can get a pretty good idea just how well it was taken care of based on where it is sitting while for sale. If it is in their driveway, with weeds growing through the bottom, then you know it has not been used in a good long time. In this case, you are going to really have to crawl underneath and check all the lines, to make sure they are not rotten. It is actually better to get a RV , that has been used a lot and a bit worn looking. Even if it looks a bit tired, at least everything was being used and not ceased up. You can get a perfectly clean looking trailer, but if they have not used it in a couple of years, and did not winterize it or drain everything, you could be looking at some trouble. Your first clue, is whether they put on new tags for that year on the license plate. The one we looked at had not been licensed for the road in 2 years. We knew right away that we could have trouble with water lines, if it was not drained properly and not used. When people are trying to save money, recreational vehicles may not get the maintenance they deserve, and if they decide not to use it, they don't bother spending the money on insurance or tags for their plates. So this is definitely a clue on the last time the RV was used. It would be like leaving a house empty for a couple of years, there is likely to be some problems somewhere. Things ceasing up, motors not working etc..
Can it Get a Safety Check? If you can, buy it with certificate of safety. You may have to pay a bit more for this, but if your RV is road worthy then you will be happier. If you are prepared to do some work, then you need to negotiate a price based on the work. You could put an offer on the RV, that has a condition of a safety check, then negotiate a price based on the list of repairs that are needed to make this RV worthy. If the owner of the RV does not want to do that, then you either offer less or walk away. We finally purchased our RV after answering the ad, and all though old and a bit beaten up looking, it had been used every year. So, the owner had kept up with some maintenance. Which made it easier for us. Also, because it had been licensed every year, it was much easier for us to get a temporary permit to drive it off the property. Getting it off the property is another concern. If you are going to have to tow it, you will need a heavier duty tow truck, and this should be considered in the price, or get the owner of the RV to do this for you. So, if you answer an ad, and they say they use it all the time, but their license plate tag is expired, that proceed with caution. If you don't feel confident, take a friend with you, hopefully a mechanically inclined one! This way you can check it out. If the owner does not want you trying to start it, or crawl underneath it, then walk away. We ran into a RV owner, that would not let us try and start it, until we put a deposit on it. We turned and left. You can save a lot of money, if you purchase one through an ad. If you are really scared about what you will get, then you can take the plunge and buy one from a RV dealer. But if you just take your time, and look. It is like looking for real estate, it is basically a house on wheels. You would not likely buy a house that was dirty or falling apart unless you were willing to put in the work. Check out the stove, look in the oven (we found a mouse nest in one oven!) sit at the table, just like you are looking at a house. You need to get a feel for this RV. When a RV owner put in an ad. they have to expect you are going to have a good look around. It is the same when buying a owner sale. So, walk into one, and picture yourself living in it, cooking in it, showering in it. If everything looks worn out including the cushions, these can all be upgraded. You can actually do a bit of a DIY renovation to a RV for sale by owner, and still be cheaper than some lots. So, don't give up. A bit of time invested, can find you a great RV, and you can take it home and make it your own. 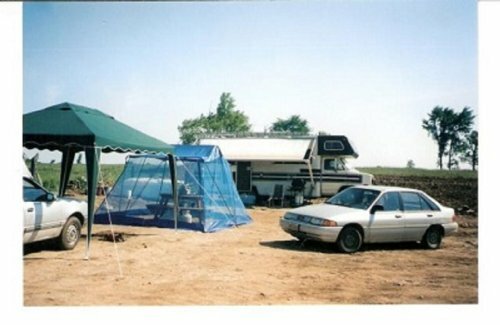 There are some great sites for RV parts, and accessories to make it feel like yours. There have even been some decorating DIY shows on upgrading an RV as many people tour around in them. So get out shopping, and don't forget to check out ads that say for sale by owner. as well as RV lots, become an informed purchaser and get the best deal you can.